Xanax, or alprazolam, is a member of the benzodiazepine family, which includes diazepam, chlordiazepoxide and midazolam. Benzodiazepines are used as sedatives, muscle relaxants, anti-anxiety agents and anti-convulsants. Some are used to enhance the effects of anesthesia. Like most medications, Xanax can interact with other drugs, and its beneficial properties and side effects can be altered by agents that either accelerate or delay its metabolism. 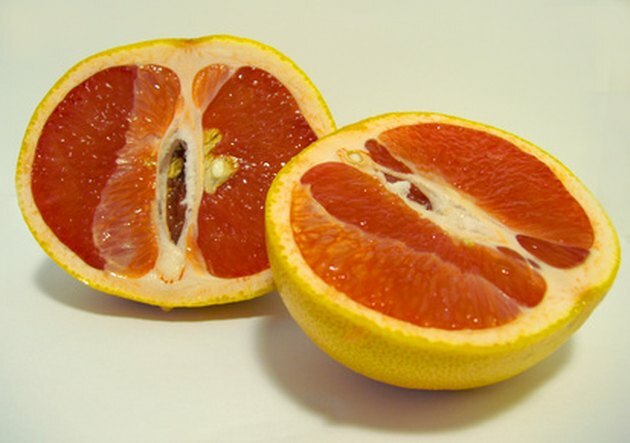 Grapefruit affects the metabolism of many drugs, including Xanax. The cells of your intestine and liver contain an array of cytochrome enzymes that help detoxify potentially noxious substances in your diet. According to a January 1998 "American Family Physician" review, cytochromes are iron-containing proteins that transform drugs and other compounds into water-soluble forms that can then be eliminated from your body through your urine or bile. Dozens of these enzymes have been identified; the cytochrome designated CYP3A4 is involved in metabolizing a variety of medications, including Xanax. The December 1989 issue of "Clinical and Investigative Medicine" first described grapefruit's ability to alter drug metabolism. A study designed to evaluate alcohol's interactions with felodipine, a new blood pressure drug, used grapefruit juice to mask the flavor of alcohol to "blind" the study's subjects. When co-administered with grapefruit juice alone, felodipine blood levels "greatly exceeded the expected concentrations," according to the study's authors. Scientists have since learned that grapefruit blocks CYP3A4, thereby allowing higher amounts of many drugs to enter your bloodstream. When you take Xanax with grapefruit or grapefruit juice, you could experience enhanced side effects due to higher-than-normal levels of the drug reaching your bloodstream. In effect, your Xanax dosage is increased, which could lead to drowsiness, difficulty with concentration, slowed reaction time, unsteadiness, dizziness, speech problems, difficulty breathing and increased salivation. According to Drugs.com, you could also experience paradoxical side effects, such as anxiety, irritability, overstimulation and suicidal thoughts. Grapefruit and grapefruit juice interfere with intestinal enzymes that metabolize Xanax, thereby increasing the amount of medication reaching your bloodstream. Amplification of side effects can be troublesome or even dangerous, particularly if you are driving, operating machinery or working in hazardous settings. If you take Xanax or another benzodiazepine, consider eliminating grapefruit products from your diet. If you choose to consume grapefruit, talk to your doctor about changing your Xanax dosage or taking another medication that does not interact with grapefruit.